Left-hand handlebar switchgear for scooters with integrated high and low beam, indicator switch and horn. 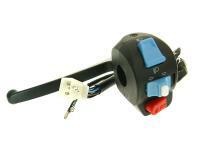 Please check the product image, as various switchgears are factory-fitted on different models. ATTENTION: this switchgear is only suitable for scooters with a separate fitting for the rear brake The brake lever mount is not on this switch gear.